David Salo, author of the dialogs and inscriptions in the languages of Middle-earth which are used in Peter Jackson's movie, has recently informed on Elfling that he is going to make a website with his linguistic inventions prepared for The Fellowship of the Ring (he wrote: I have been working on putting together a web page, but until recently I have not had much time. I hope things will come together a little faster now, but I don't have a date when it will be ready). Salo wrote a little about Khuzdul and Adûnaic in the movie soundtrack. On Khuzdul: This is pseudo-Khuzdul; i.e., it's in a language which has the same sounds as Khuzdul, and a similar morphology, and shares a few words, but probably doesn't otherwise resemble Tolkien's Khuzdul much. On the language heard when the Black Riders are riding: It's an attempt at Adûnaic, what can be done with the limited data anyway. In March 2002 Warner Brothers published The Fellowship of the Rings sheet music which included some lyric material (both Elvish and English) not present in the CD booklet. Titles included in this publication are: The Prophecy, Many Meetings, The Council of Elrond Featuring "Aníron", Lament for Gandalf (Featured in "Lothlorien"), In Dreams (Featured in "The Breaking of the Fellowship"), May It Be. After this publication we could find out which fragments of the lyrics are really sung in the soundtrack. Thanks to Jaime Ondrusek for this information! 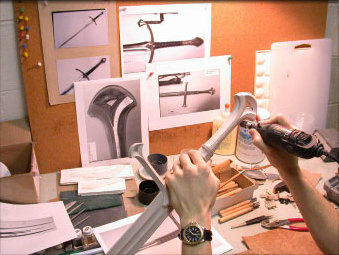 Kit Rae, an Art Director of the United Cutlery Corporation, has informed us about the Elvish inscriptions on the swords occurring in The Lord of the Rings movie. This information can be found in our movie linguistic survey. The newest info concerns the sword Narsil which will occur in The Two Towers. Aragorn's reforged sword will contain a Quenya inscription which reads: Narsil essenya, macil meletya; Telchar carneron Navarotesse or 'Narsil [is] my name, a mighty sword; Telchar made me in Nogrod'. 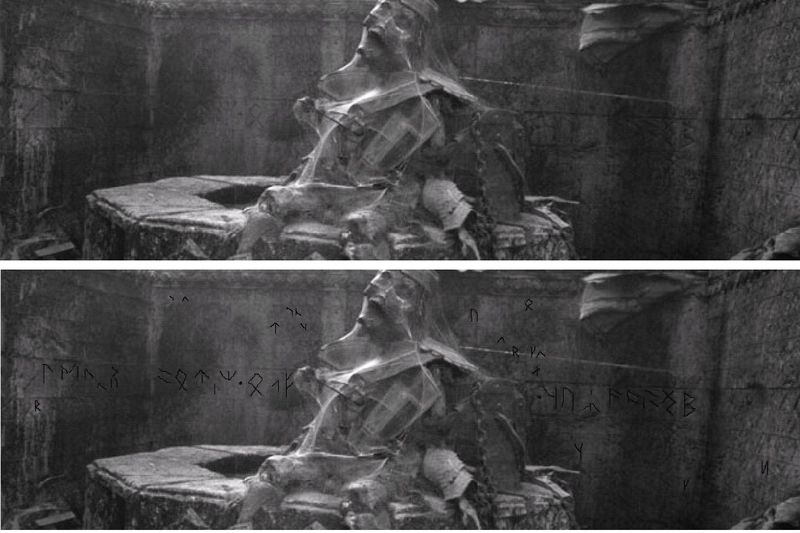 For detailed analysis of this Quenya inscription see here. I present four captured frames from the National Geographic video entitled Beyond the Movie. This 53-minutes-long film has been published today in Polish magazine "Focus". This is an inscription from the sword of Arwen (known already from an archive report What is Arwen's sword inscription). 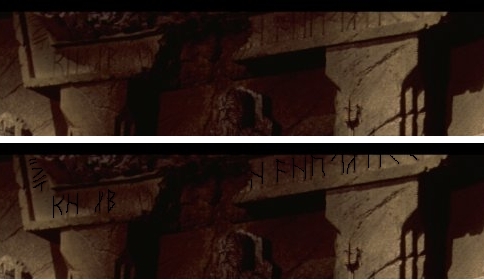 We can see a long Sindarin tengwar inscription (see above). Its first words, according to Gildor Inglorion, are Aen estant Hadhathang i chathol hein-thand '[It] was named Throng-cleaver, the broadsword-blade, shield [=defence?] [to] them...' . As we can see Arwen's sword is named Hadhathang 'Throng-cleaver' in the film; cf. Sangahyando in LR 389. For detailed analysis see here. UPDATE! According to Kit Rae, an Art Director of the United Cutlery Corporation, Arwen's sword name is Hadhafang 'Throng-cleaver' (Sindarin version of the the Quenya name Sangahyando). The movie background for the name Hadhafang is this: It once belonged to the Elvish princess Idril, who wed a mortal man Tuor and bore Eärendil, the father of Elrond who in turn was father to Arwen. For whole inscription and for its analysis see here. 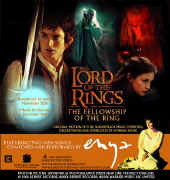 Official movie website: More about Elvish! The official LotR:FotR movie website's last update is good news for anyone who loves the Elvish languages. On the web-page entitled Elvish Translator you can find few Elvish (Sindarin) dialogs and phrases from the movie with transcription and translation. Thanks to the Audio Guide you may listen to three Sindarin sound-clips (Arwen and Aragorn in Rivendell, Galadriel in Lothlórien and Arwen and Aragorn before Bruinen Ford) illustrated with the photos from the film. There is also a very interesting exclusive online video 'behind the scenes' with three Sindarin phrases not found in The Fellowship of the Ring. Two of them were presented by me here and here; the third one, by Elrond, is more or less I aear can ven amar (maybe somebody can decipher this sentence?). The video presents the work of the language coaches, and contains interviews with Liv Tyler, Viggo Mortensen, Orlando Bloom and Director Peter Jackson. You can also send your friends an Elvish greeting from The Lord of the Rings with customizable postcards! UPDATE! According to Javier Lorenzo the Hugo Weaving's (Elrond's) Sindarin phrase reads: I Aear cân ven «Namar» or 'The Sea calls us "Farewell"'. Does it come from The Return of the King? Sound clips with Elvish dialogs! Thanks to the help of Thomas Deece you may listen now to all Sindarin and Quenya dialogs and phrases from LotR:FotR film. Gwaith-i-Phethdain presents multimedial Dialogs: a linguistic survey! On TheOneRing.net we can read that Cate Blanchet has confirmed on Fresh Air that there were more Elvish dialogs in the movie. Probably the DVD version of the Fellowship of the Ring (in shops in July 2002) will contain a scene with Aragorn and Galadriel speaking Sindarin, and maybe also there will be more dialogs between Aragorn and Arwen, and between the Fellowship and the Lórien guard. Some of these dialogs you can find in Dialogs: a linguistic survey. Finally we can see all the Elvish (Sindarin and Quenya) and Khuzdul dialogs that appear in the movie dialog list. Thanks to our reporter Gwaith-i-Phethdain presents Dialogs: a linguistic survey. Cuio mae! Its almost ready: here you can find a lexical analysis of the Elvish lyrics in the LotR soundtrack. Discover every single word put together into Elvish lyrics by David Salo! On Fotki.com you can find a lot of new interesting photos from Casa Loma exhibition in Toronto. Let us take a look at Glamdring, Aragorn's knife, etc. See here. 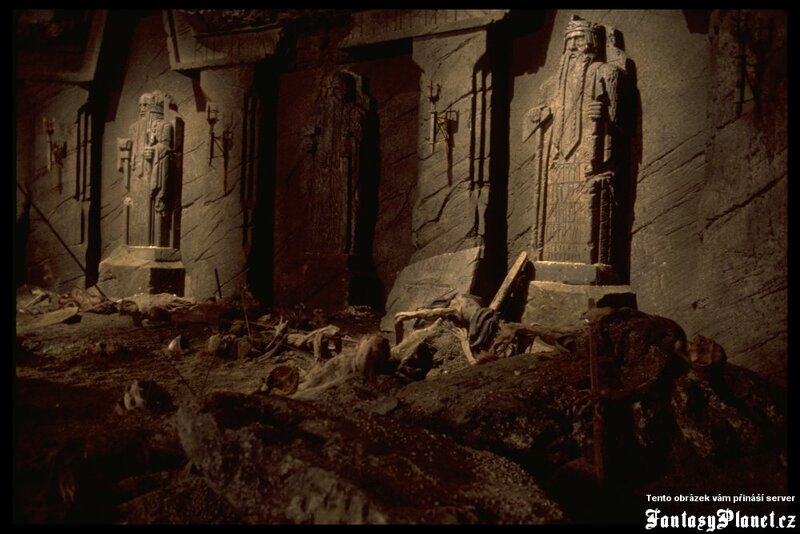 aware of the Balrog in Moria and he wants to force the Fellowship there. Cuiva nwalca Carnirassë; nai yarvaxëa rasselya. Losto caradhras, sedho, hodo, nuitho i ruith. On tape, the scene sounds different: First we hear Saruman's voice, mostly ununderstandable, but the last word is clearly rasselya, stressed on the first syllable. (not sure about the talto. But it's certainly dissylabic and the last syllable has a dark vowel). The stressing is odd nai yarvAksea rAsselya tAlto nOtto kArinnar", probably for metric reasons. I noted, however, a couple of other surprising stressing in Saruman's texts. Immediately before Saruman's spell is heard, Legolas observes "there are foul words in the air", which is IMHO a remarkable reaction to Quenya vocabulary. In any case, the spell *looks* very much like Quenya to me, although I cannot guess any of its meaning". See here for the linguistic comment. What about the languages spoken in the movie. Which is Saruman's accent? Christopher Lee: No accents. I speak normally. There are British actors, Australian actors, Newzeland actors, American actors. And actresses of course. We all speak English without accents. The other languages are Elvish: Sindarin and Quenya. You can learn Elvish, if you want. It's a language like Italian and English. You can learn to read it, you can learn to write it and you can learn to speak it. The Elvish languages are two. Sindarin is, basically, Welsh. More or less. Quenya is Finnish. Most of the elves speak Sindarin and most of the characters do speak Elvish. Not all the time. I also speak a bit. And there will be subtitles during these Elvish conversations. 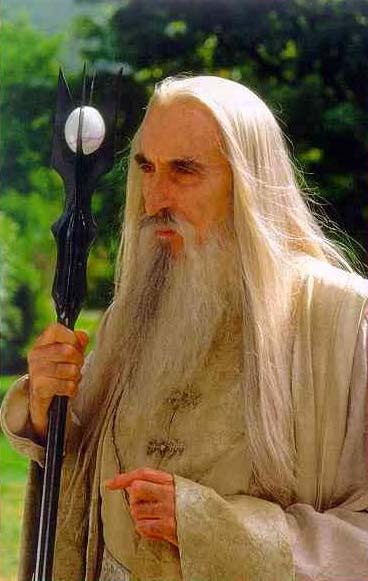 Christopher Lee: Sindarin. It was extremely difficult. (At this moment Christopher Lee said an entire line in Sindarin - see above). This is Sean Astin's tattoo: a short text written with Fëanorian letters called tengwar. Sean made an appearance on E! Entertainment on 8 November, 2001 and he was kind enough to show his 'Fellowship' tattoo. Strange enough! According to Sean's own words the tattoo says: NINE. The spelling seems very odd. Identical Tattoos: A Great Way to Bond. Because of the intense working relationship, the Fellowship of the Ring cast members bonded to an unusual degree. "The only thing I can compare it to is how close people become in the military," says Astin. "We were always hanging out together in town. We all took up surfing together. And at the end, we all got a matching tattoo - in Elf script it says, 'The Nine.' Everyone got them in different places. Mine's on my ankle - the Hobbit foot - because Billy Boyd, who plays Pippin, got his on his ankle and I thought it was very appropriate given that we were Hobbits." Decipher has presented recently a card with... Arwen's sword. Its name is Gwemegil. This name must have been invented by the language specialists in the LotR movie. What does Gwemegil mean? Maybe 'Maiden's Sword'? 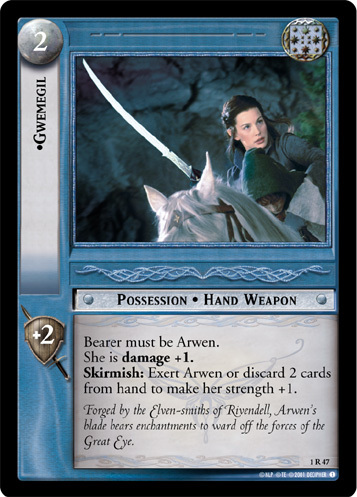 As we can read on the card: "Forged by the Elven-smiths of Rivendell, Arwen's blade bears enchantments to ward off the forces of the Great Eye". Last month I presented a picture with details of the Gwemegil blade and I asked for your help in deciphering the last part of its inscription [see here]. The form Gwemegil is interesting too. It consists of two elements: gwend 'maiden' + megil 'sword'. Language specialist who invented this name (David Salo?) claims that -nn-m- > -m-. What do you think about this? UPDATE! Gwemegil's name occurs only on the Decipher's card. You will not find it in the movie! Gwemegil < *gwemmegil < gwen-megil (as Boromir < *borommir < boron-mir). What do you hear in "Aníron" by Enya? "Aníron" by Enya as presented at the French website Le Film is very hard to interpret. Some linguistists have tried to write down what they hear in the MP3 file. This is the result. I wonder who of them is closer to the original. We will see on November 20 when the CD is in our shops. Javier Lorenzo: ava cheb i .... / ? ?chae aníron Undómiel // tíron ir ??eriad...._?? / chae aníron 'the ??? 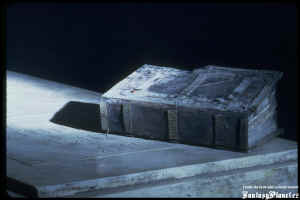 won't keep .... / far [lenited] I wish Undómiel // I watch the rising .... / far [lenited] I wish. UPDATE! Enya's song can be finally found in the Soundtrack: a linguistic survey where I analyze all the Elvish lyrics from the movie soundtrack. 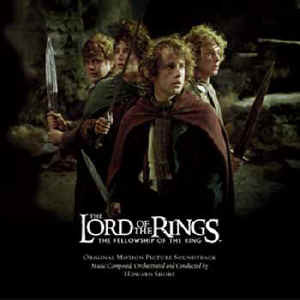 French website Le Film presents three fragments of the LotR movie soundtrack. The most interesting are Aniron and Lothlórien with Elvish lyrics. Unfortunately the quality is not good and I cannot separate individual words. Maybe somebody can help? TheOneRing.net has published whole lyrics of May It Be previously published on Gwaith-i-Phethdain by Javier Lorenzo. Tolkien Online has published a link to May It Be, one of the songs specially made by Enya, available for download. This song contains two Elvish sentences: Mornië utúlië 'Darkness has come' and Mornië alantië 'Darkness has fallen'. More and more runes in Moria! Czech website Film Pán prstenu mentioned recently on this website presents more and more interesting photos from the movie. Some of them contain very nice linguistic material. 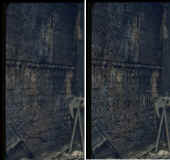 See these two pictures from Moria and try to decipher the cirth on the walls. It is a very interesting challenge! Send your results to Gwaith-i-Phethdain! A great Moria hall. Statues of three Dwarvish kings (?) with runic inscriptions. Ready to be deciphered! Mazarbul Gate. Many runic inscriptions on the wall. Try to read them! 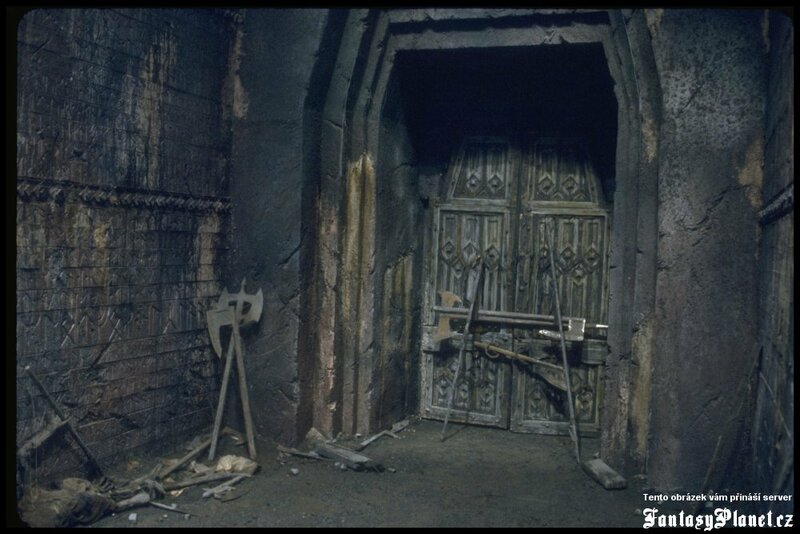 Czech website Film Pán prstenu contains a lot of interesting photos from the LotR movie. We present one of them (on the right) with Book of Mazarbul (lit. 'Book of Records'). 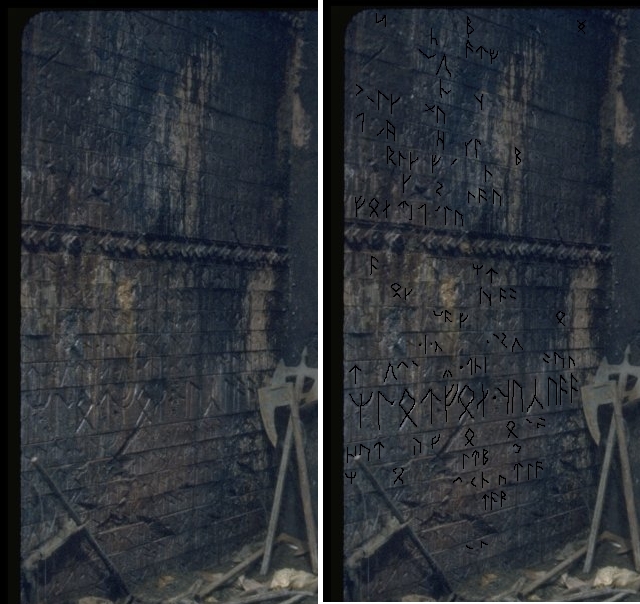 The huge book has a runic inscription which according to Patrice Blancho reads: mazarb zigintarâg khazaddûmul or 'Records [of] Long-Beards [= Dwarves] [of] Moria'. The book lies on the Balin's tomb with runic inscriptions known from The Fellowship of the Ring by J.R.R. Tolkien. See here for the analysis. Enya does sing in Sindarin! I need your help. I am not able to decipher all the inscription and I hope you can help me. If you have any ideas write to me.